It was just past 9 a.m., and already the sun was beating down as we left the cobbled lanes and low-slung buildings in the town of Tequila for a day trip into the Mexican countryside. Fields of blue-green agave plants, their spiky leaves stretching toward the morning light, flanked mountain roads in the shadow of a dormant volcano. With Clayton Szczech, a Spanish-speaking, American-born tequila expert as our guide, we were exploring La Ruta del Tequila, not a prescribed route so much as a meandering drive through lush valleys lined with family-owned distilleries, elegant haciendas, and roadside cantinas dedicated to the production and consumption of the country’s signature spirit. A focus on craft – slow food, farmers’ markets, craft cocktails, and, as Szczech puts it, “in general caring about how things are made and where they come from,” by U.S. consumers, who account for half of all tequila sales – means microdistillers here are reviving old-world techniques to produce small-batch, premium brands. The area’s biggest distilleries, who rely on more modern methods to meet mass-market demands, offer public tours and tastings, but with Szczech leading us on an outing for Virtuoso Life Magazine, arranged by Journey Mexico, we were were able to go behind the scenes. 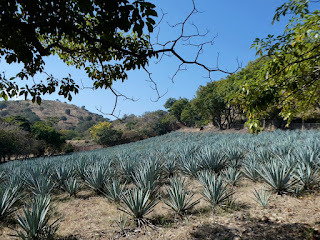 We met with several smaller, boutique producers during our three-day visit to this less-explored spot, which definitely merits a stop for travelers looking to deepen their understanding of tequila. An outgoing former California punk rocker, Szczech has earned national recognition for his tequila knowledge. Working his industry connections, he arranged private, by-appointment-only visits and a gourmet picnic lunch of fajitas and chicken mole cooked by local women on the grounds of Casa Herradura, a historic hacienda owned by the Tequila Herradura distillery, as well as a tour of the Cascahuín distillery. 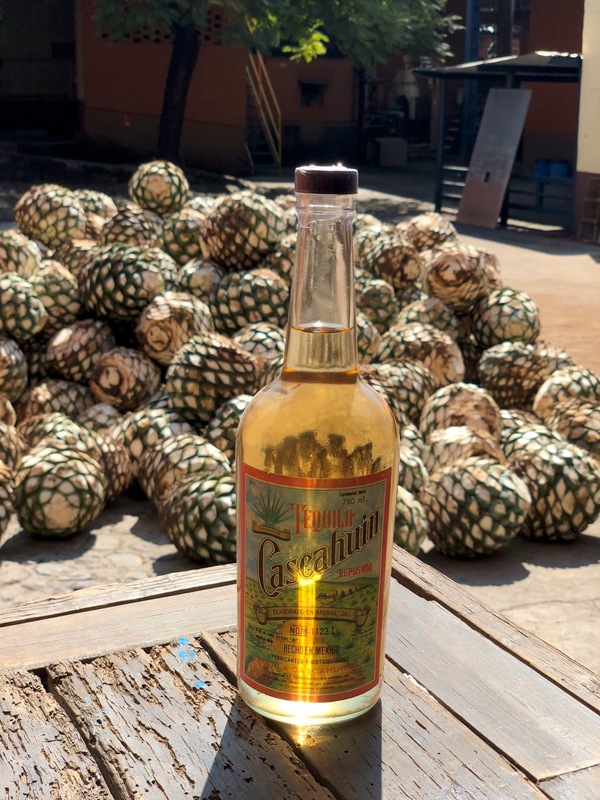 Members of the Rosales family, whose ancestors began making tequila 114 years ago, waited for us on the sidewalk outside Cascahuín in the town of El Arenal. 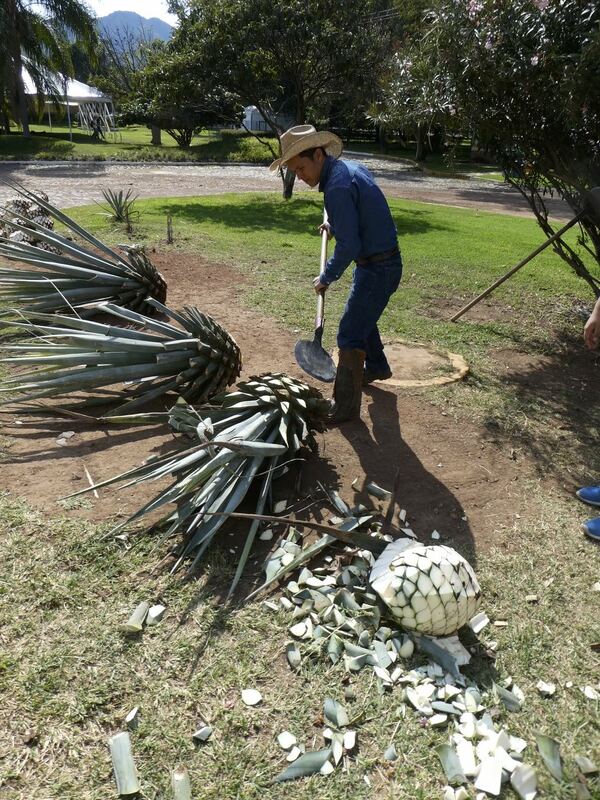 At 32, tequila maker Salvador Rosales holds a master’s degree in tequila production, but it’s past generations he looks to for inspiration as he guides the family business in the twenty-first century. His grandfather didn’t finish high school, but he knew a little something about making what was called vino de mezcal, a high-octane spirit made from the juice of the blue agave. Then, as they do today, skilled farmers, called jimadores, wielded long-handled, flat-bladed knives to harvest pineapple-shaped hearts from plants that take five to nine years to mature. Tossed like footballs into a wood-fired, earthen pit oven lined with volcanic rocks, the “piñas” would cook for days before being hand-crushed with mallets to release a sweet syrup that was fermented in wooden vats, distilled in copper pots, then rested in containers covered in corncobs. 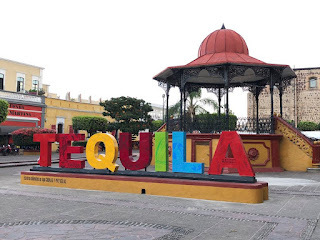 On the flip side, back in Tequila, La Rojeña – the distillery of the biggest and best-known tequila brand, Jose Cuervo – dominates the town of 40,000, the most popular stop in an area designated a UNESCO World Heritage site in 2006 for its distilling heritage. 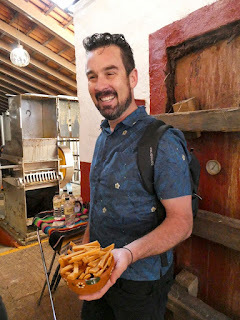 Most visitors arrive in Tequila by bus or tourist train, tour La Rojeña, buy a few bottles of tequila and maybe a hat woven from agave leaves sold by street vendors, then leave by late afternoon, missing out on the delights of a small, safe Mexican pueblo without the crowds. 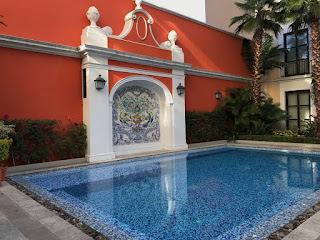 Best advice: Do as many affluent Mexicans do, and spend a night or two at the elegant, colonial-style Hotel Solar de las Ánimas, built to resemble a typical Mexican house in the seventeenth and eighteenth centuries, with stone pillars and tiled floors. Settle in at the rooftop Sky Bar overlooking the town plaza; order the fresh tuna tostadas and a Smoky Margarita, made with tequila, agave syrup, lemon juice, and a sprig of flaming rosemary, and take in the views of the volcano and Sierra Madre mountains. Designated a Pueblo Mágico (Magic Town), Tequila lives up to the reputation, welcoming visitors by day with colorful shops, tasting rooms, and museums, and revealing a lively local scene by night, when the plaza fills with strolling mariachis and push-cart vendors hawking roasted corn and tequila drinks. 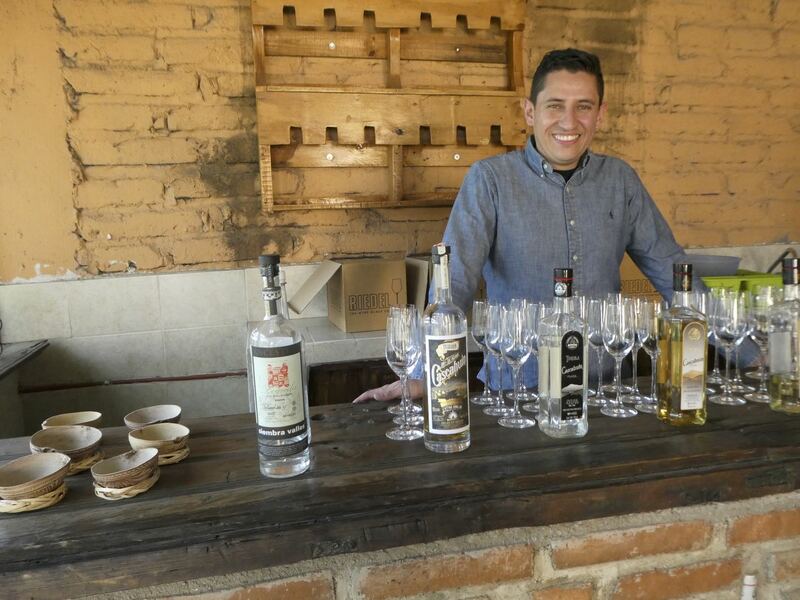 As we sat a long table next to his outdoor bar in El Arenal, Salvador Rosales poured from a bottle of Siembra Valles Ancestral, a 100-proof blanco (white) tequila produced for the U.S. market using his grandfather’s old-school methods. With virtually all new agave plants reproduced by cloning rather than from seed, the family is experimenting with letting bats naturally pollinate the flowers. Akin to the Rainforest Alliance’s work with coffee farmers, the bat project aims to help growers cut back on chemicals and produce healthier, more sustainable agave that’s better able to fight diseases that nearly decimated the crops a few years ago. Tasting from a cup made from the shell of a local tree fruit, I pick up notes of smoke and pineapple in my first smooth swallow. Certified “bat friendly” and retailing for around $100 a bottle, this is a drink meant to be sipped and savored. 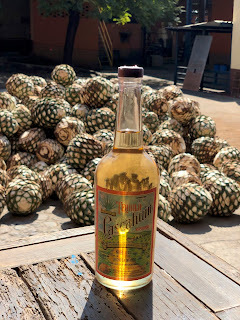 “The first thing you want to look for on a bottle is ‘100 percent agave’ ” – meaning the plant is the sole source of sugar used to make the alcohol, as opposed to harsher “hangover” blends mixed with cane sugar or corn syrup – Szczech told us on a visit to Tequila Fortaleza, a microdistillery owned by fifth-generation producer Guillermo E. Sauza. After the family business was sold (it now operates as Tequila Sauza, one of Mexico’s biggest distillers), Sauza returned to his ancestors’ hillside hacienda in Tequila and revived an old-time distillery that had been converted into a museum. 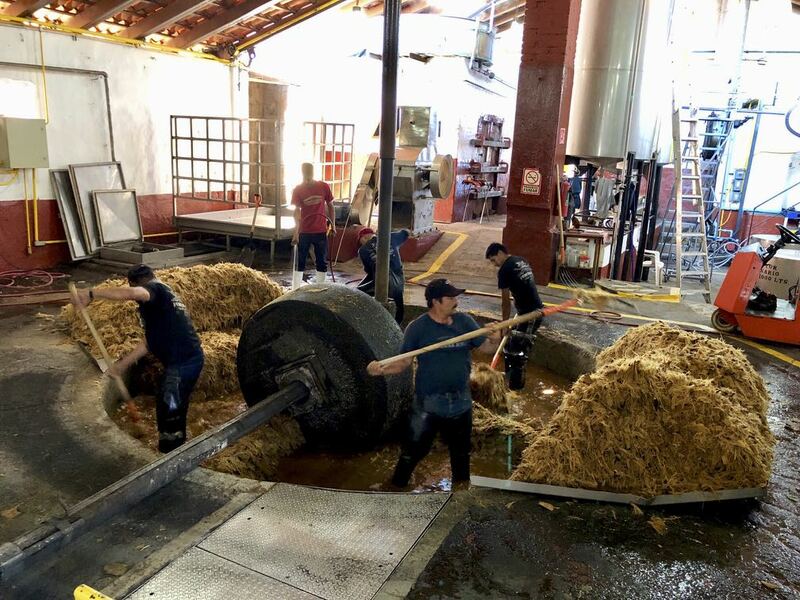 Here, the agave steams in brick ovens, emitting a faint smell of sweet potatoes, then is transferred to a circular pit to be crushed by a two-ton stone wheel pulled by a small tractor (in times past, a mule did the work). Men in white rubber boots follow behind, working the mash with hoes and pitchforks before hosing it down, pressing the water out by hand, and pumping the juice into wooden fermentation tanks – a labor-intensive process akin to making a sauce with a mortar and pestle instead of a food processor. Inside a candlelit cave, Szczech leads us through a tasting, pouring from bottles lined up next to a row of Champagne-style glasses. There is an unaged blanco, bottled soon after distillation; a reposado, aged in oak barrels for seven months; and an añejo, aged for two years. “The question I always ask is, are you tasting or drinking?” Szczech says. “There is a right way to taste. When it comes to drinking, do it however you like.” He pours the tequila into the stemmed glasses, telling us that “the glasses really do matter” when it comes to sensing the different aromas. We look for hints of citrus and sweet agave in the blanco, caramel notes in the reposado, and vanilla and butterscotch in the añejo. For me, acquiring a taste for drinking tequila straight will take more practice. But Whitney Shindelar is right about the cocktails. 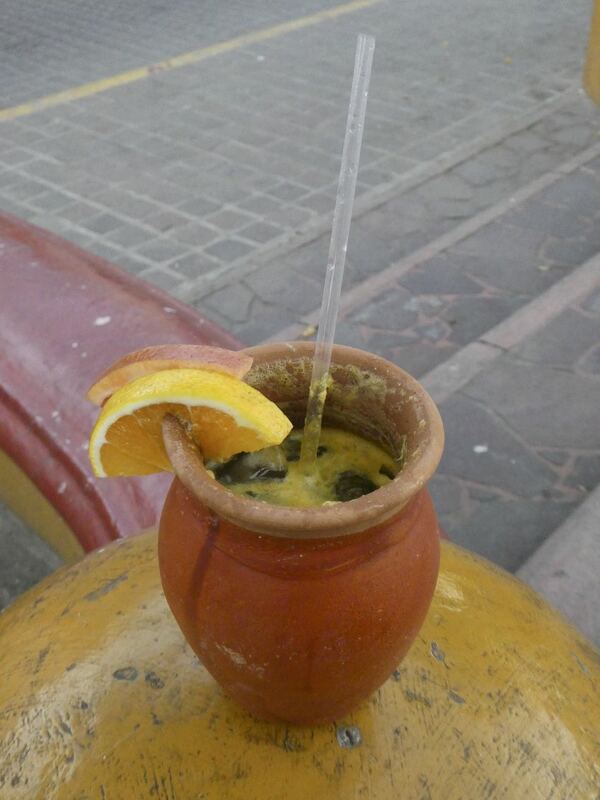 Solar de las Ánimas draws on its large collection of premium spirits to come up with creative specialty drinks, such as a fiery mango-and-habanero margarita, and riffs on standbys, like its Bloody Maria, a mix of tequila and lemon, strawberry, tomato, and clam juices. 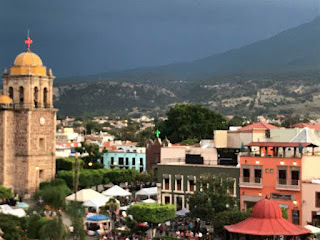 On our last evening, we joined the locals on the plaza, strolling and listening to mariachi music while sipping cantaritos, drinks street vendors make with tequila, grapefruit soda, lime, and salt, served in little clay cups. Accordion music mixed with the clang of church bells as women in bright dresses and men in suits gathered for a wedding. Kids climbed on big letters spelling out TEQUILA in the plaza. The tour buses were gone, the tasting rooms were closed, but it seemed as if the party was just getting started. The air filled with the scent of agave cooking at the Cuervo distillery, reminding us again that this was no ordinary Mexican town. It was magical. 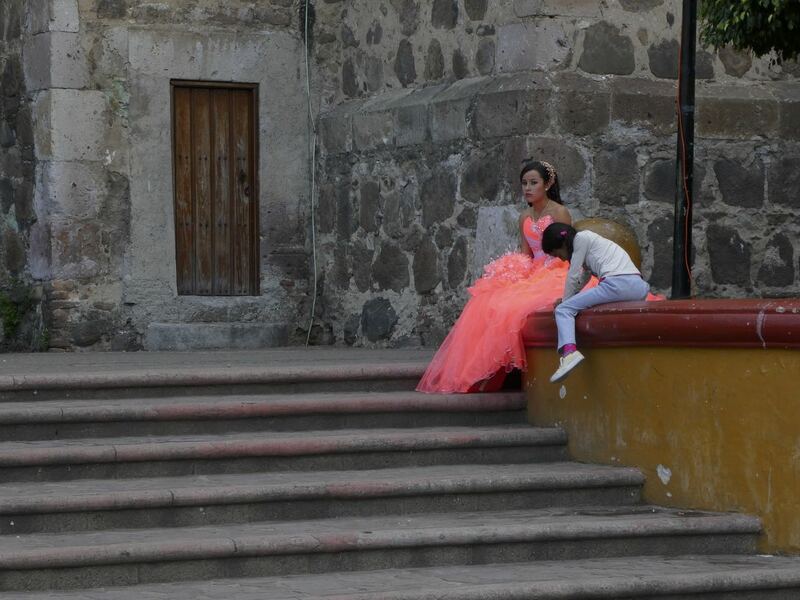 Colonial-style Hotel Solar de las Ánimas overlooks the main plaza and the eighteenth-century church of Saint James the Apostle in the heart of Tequila. Two pools, one at ground level and the other on the rooftop, offer a respite from the afternoon heat. 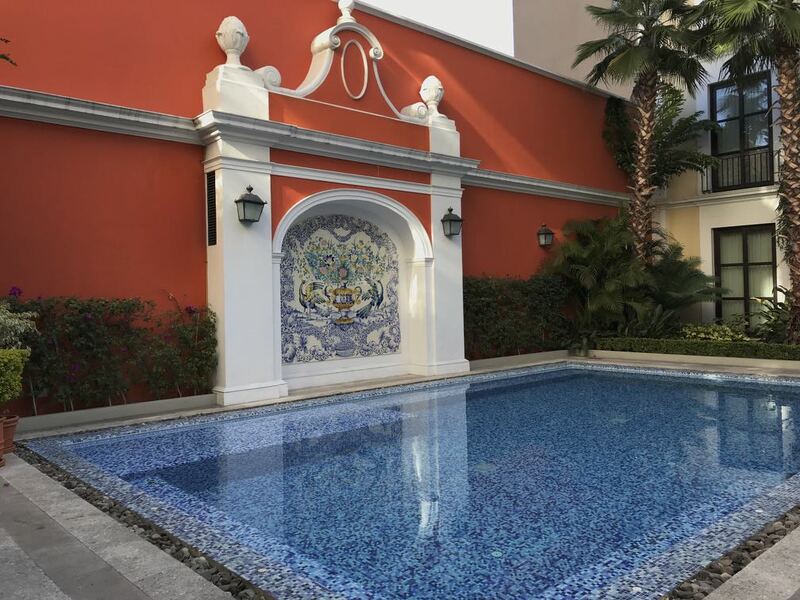 Garden areas with tile floors and stone pillars surround 93 contemporary rooms and suites. At the Sky Bar, try the strawberry basil margarita or my favorite, the smoky margarita, served with a sprig of flaming rosemary. Doubles from $130, including breakfast daily and a visit to the agave fields. This story appeared in the November, 2018 issue of Virtuoso Life magazine. Carol Pucci is the former travel writer and Travel Wise columnist at the Seattle Times. She is a contributor to The Seattle Times, JoeSentMe.com, Virtuoso Life magazine and Northwest Travel magazine.